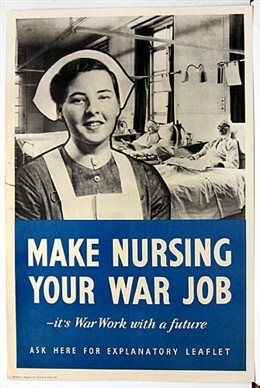 My name is Lydia and I was trained as a wartime nurse. Of course the war took away a great chunk of our lives, 5 years, so a lot happened in that time. I would like to tell you rather a funny story. I was doing my first stint of night duty at St Giles hospital, in Camberwell, SE5; there is not much of it left now. We had no windows as they had been blown in or out, the black-out curtains had been blown over the patients. Those that could walk would go down to the shelter. But of course there were patients who couldn’t walk and one such patient called me over to her bed and asked me to hold her hand because she was so frightened, so I did that. I broke the rules and sat on her bed and took her hand and she said to me in her real cockney voice “You're shaking more than me love, get under me bed, you’ll be safer there”. Needless to say I did not get under her bed, but how lovely that we could both shiver together. Then at the end of the war, I was a young married woman, Sainsburys was my favourite grocers shop, then word got around that they had a consignment of sausages and we had better get up there quickly if we wanted to get any, so I got on my bike and shot up to Sainsburys and joined the queue only to get two sausages! This page was added by Camilla Bergman on 30/08/2011. My mother was bombed in 1940 in the first bombs to fall on Newham, West Ham. She was in hospital badly injured, dressings over her eyes and legs and unable to move from her bed. I thank god for the nurses who took turns in staying with her and holding her hand during further raids.